There was a time when I was younger that I would have lived on pizza if I could. I mean what’s not to like about it? Now that I’m an adult with children of my own, we still enjoy pizza often though not every day as I said I would do when I was a kid! Popping a frozen pizza into the oven for supper is perfect for those busy nights where you don’t feeling making a big meal and it’s always a hit. I usually have to cook two pizza since everyone wants seconds (or thirds). If you live near a Costco, you need to try Sabatasso’s New Thin and Crispy Gluten Free Pizza! It’s a brand I hadn’t heard of before. So much for thinking I knew my pizza right? I’m glad I have a freezer stocked full with this pizza because it’s absolutely delicious! 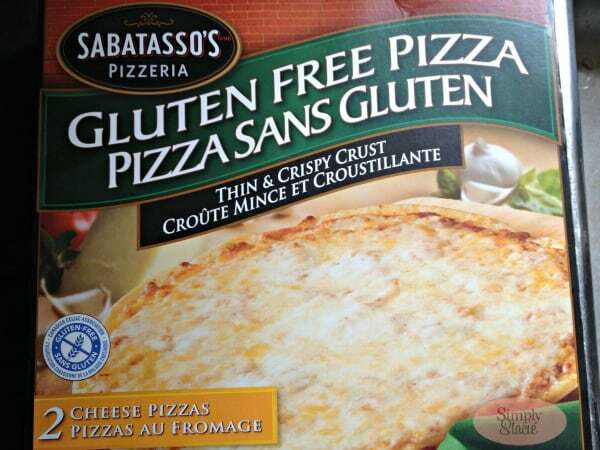 Sabatasso’s Thin and Crispy Gluten Free Pizza is certified by the Canadian Celiac Association Gluten-Free Certification Association. I followed a gluten free diet about 5 years ago when we were trying to figure out if changing my diet would impact my chronic pain levels. It didn’t so I stopped following it. What I remember about being on that diet though was how hard it was find food I actually liked the taste of. Everything in the gluten free frozen section just tasted a bit “off” to me. I wasn’t sure what to expect from Sabatasso’s Pizza., My initial pre-judgement was way off. I would have never known this was a gluten free product because it tastes amazing and there’s nothing “off” about this pizza at all. I wish this pizza would have been around when I was on my gluten-free diet. I tried the cheese pizza which has a blend of different varieties of cheese including mozzarella, fontina, parmesan and Asiago. The tomato sauce is Sabatasso’s unique signature sauce that is full of flavour. If you wanted, you could add your own extra toppings at home, but were content eating it as is. It cooks for about 10 to 12 minutes in a 425°F oven. The crust is thin and crispy and cooked to perfection. I prefer thin crusts vs. thick doughy crusts. Plus, there’s two pizzas in each box! I normally have to make two pizzas anyways so it’s cool that Sabatasso’s has two per package. Even if you only want to eat one, both pizzas are wrapped separately so you could just pop the one you aren’t making back into your freezer for a later date. Sabatasso’s NEW Thin and Crispy Gluten Free Pizza was a hit in our home. Pick one up the next time you are at Costco and give it a try. We may just have to make a run to the city once our supply runs out! I’m not restricted to gluten-free, but I like trying different flours, and this sounds and looks great! I’m now soooo hungry ! I’ll be looking for this next time I go shopping! I’m going to have my sister pick me up a couple of these next time she’s at Costco! Thanks so much for this review! I wish we had a Costco near here 🙁 I have been considering trying a gluten-free diet to see if it would help with my chronic pain, also. I dont usually eat pizza, and when I do I only get the fat free cheese version. its nice that this product is gluten free, but what the heck ever happened to fat free? I miss having all those fat free choices. Thanks for bringing this to our attention! I will look for Sabatasso’s when we go back to Costco this week! Whoa, that looks good! Mamma mia! I don’t care if it’s frozen, it looks great – all that cheese! I’m buying this! Thin and crispy is my number 1 priority when it comes to pizza. I definitely gotta try it. This pizza looks delish! 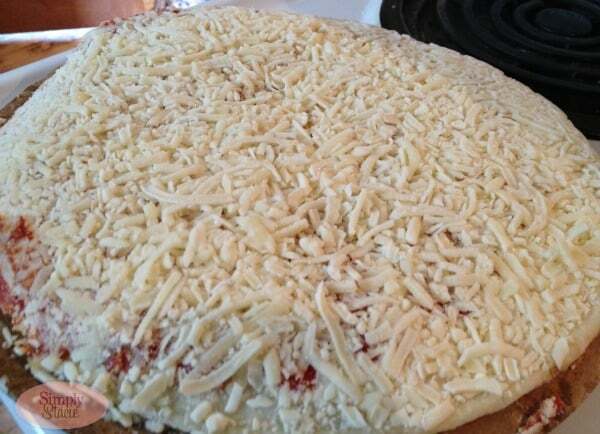 What a good amount of cheese – usually you don’t see that on a take home pizza! Hope I can find this. My sister is gluten free, and always looking for good products. Thanks for the review! Nice to have a good gluten free option available. Pizza is a staple in our house. It started during football season and has continued on. My husband and I want lots of cheese and love the idea of all those cheeses used. Thank you! I knew I wasn’t the only one who could notice a change in taste when certain products became gluten-free! But I always welcome new kinds of pizzas, so I’ll give this one a try. My friend is gluten free will pass this on to her! That certainly IS the problem with gf products – so many taste horrible! I have also found that so many products are gf but horrible for you with copious amounts of fat/sugar in them instead.. It’s certainly not easy to find quick items! Have a couple of family members that require gluten-free. Nice to see that there is more available, such a terribly restrictive diet for those who have a severe case. Thanks for the review! Thanks for the review, will have to try this out next visit to costco. I am not restricted to gluten free products but I do find that when I eat certain pizza crusts and rolls I have digestive problems after. When I do find gluten free pizza dough I always buy plenty and make our own homemade pizzas. This pizza sounds and looks delicious, I am a pizza freak, next time at Costco I will be checking them out. 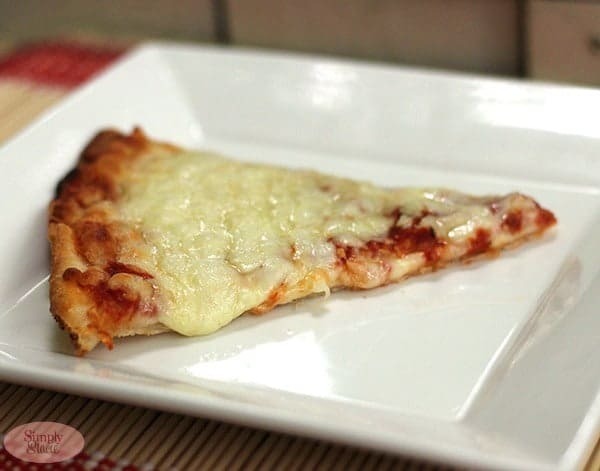 I love pizza and this pizza looks extra cheesy! I love how thin the pizza crust is so your not loading all the calories on too. I don’t eat gluten, and the rest of my family is partially gluten free. I found it made a huge difference to my energy levels and moods. And my doctors said our traditional wheat supply is so overly processed the nutritional value is way down from years ago so to try and have family eat as much gluten free as can. The great part is meat, fruit and veggies are all naturally g-free! Thank you! this is exciting. I haven’t been able to find the ingredients list ofr this pizza ANYwhere online. Do you still have the box? 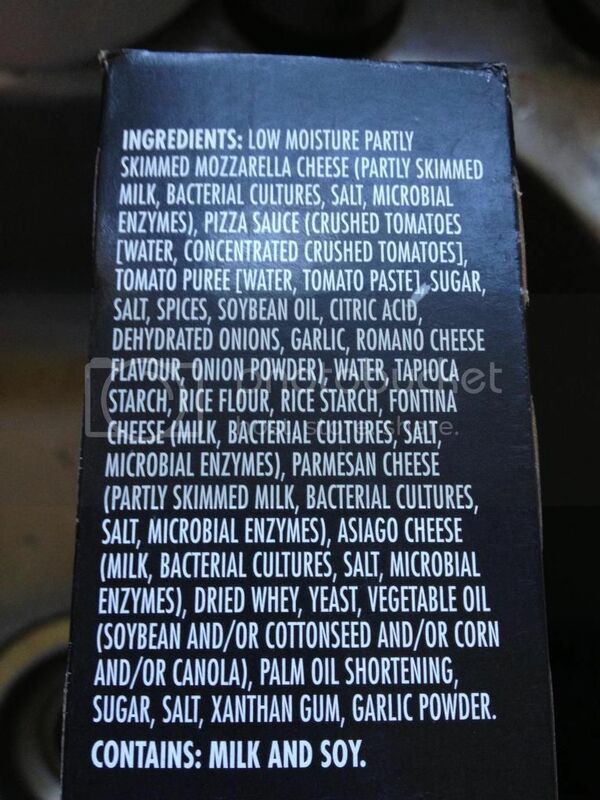 if so, might you be willing to either post the ingredients or share a photo of the ingredients list part of the box? I have extensive food sensitivities in addition to gluten. I already emailed you but leaving this here for future commenters! Where in the world can I buy Sabatasso pizza now that Costco has stopped selling it?? I grabbed a box early in the year as i normally buy anything with a GF label on it to try it out once. This is hands down the best GF Pizza i’ve ever had and it actually tastes like regular thin crust delivery style pizza. With costco though if you like it and it’s runing low on stock, buy as much as you can incase they don’t restock. My local store sold out of their shipment 2 months ago and last week i noticed a new shipment was in! Costco does a great job carrying GF products you can’t normally find. We also love the flavor of the pizza and we are GF eaters and it is nice to have a quick frozen option that we can add toppings but I have found the pizza sticks to the toaster oven and makes a giant mess! I even tried using a foil covered rack but it still seemed to stick. Did anyone else have problems with this or did a regular oven work better? We have purchased this product 3 times from Costco, and were just informed that they discontinued it! Go figure, there’s a whole asile of pizza’s & they get rid of the one that is gluten free! This product is amazing and we build on the pizza with basil, carmelized red onion & red pepper and whatever else we have on hand. My daughter who is very picky loves it! Anybody know where we can get it now? I just tried this pizza last Saturday at Costco it was wonderful! they just got it in I ready in earlier post that Costco no longer carries this pizza I am surprised as they just got it in, It may be do to supply demand. These Pizza singles are so freakin good! I love having these mini-pizzas vs having larger pizzas. They taste better when they’re smaller IMO. I know costco stopped selling this amazing pizza. Where can I get it? Please help. I have tried many gluten free pizzas and non are this good. When you tried the gluten free diet, did you continue consuming dairy products? I avoid gluten myself, but if I have dairy products, I hurt everywhere. Could be worth a try for a few months. I live in Utah and found these WOUNDERFULL PIZZA’S!! I went to Costco the other day to get some and found out that they will not be carrying them any more. I even called the corporate office they told me the same thing. Does anyone know were to get them? My son LOVES these pizzas! Also, Domino’s Pizza (not sure if they are all over) has glutten free crust now and it’s GOOD too! My problem with this pizza that I’m wondering if anyone else has is that it always falls through the rack in my oven. The middle falls through and makes a huge mess. Does anyone else have this problem? We have putting it on pans but it doesn’t turn out as good and is doughy. I just wanted to see if there were any suggestions. Can you please email me in case I can’t get back to see the responses? I put a cake cooling rack crosswise on the oven rack. Makes a rack with squares. I tried this tonight and put some pepperoni and basil on it…delicious!!!!!!! I am Vegetarian (eat eggs and Milk), so I was a bit reluctant seeing Rennet in the cheese but made an exception. Pizza is just great. Absolutely loving the thin crust concept and it remains soft. I bake it on the sheet. If you compare price/quantity ratio with other stores its a total deal. Same goes for the GoGo Quinoa Chocolate Chip Cookies. This product is fantastic, much much tastier than any gluten free pizza I have tried, even in a pizzeria. I added fresh veggies and it was perfect! very light and crispy, just the way I like it. Aside from the crust which is perfection, the sauce and very tasty cheese combination is delish!! Cheryl: I put ours on a pizza stone. You put the stone in the oven while it heats up, it makes the crust a bit crispy, but I like it that way. Also it doesn’t fall apart and you can remove the pizza right on the stone with oven gloves. It’s like baking a pizza in a real pizza oven. NB Don’t pour water on the stone until it is totally cool, otherwise it can crack. Love the thin crust gluten free Sabatassos BUT 3 out of 4 melted in the middle an dripped onto the bottom of the oven. Get that fixed and I’m a long term and loyal customer. Every time I ae this it doesn’t cookn the middle and gets burnt. What can I do? Every time I bake this it doesn’t cook in the middle and gets burnt what can I do? I tried the cheese pizza tonight…loaded it with mushrooms, olives, and extra cheese and baked it a little bit longer than the instructions suggested because of all the goodies. The pizza was disgusting, the crust just tasted nasty to both my son and I. I ended up scraping the toppings off and throwing the crust away. Safeway sells a decent GF pizza, don’t recall the name but it’s in a green box…it’s a little more expensive per pie but it’s soooo much better than this one. so, does anyone know where tonget this GF pizza ? now that it’s no longer available at Costco – the one they are selling instead is just not as good – I have the celiac and am a native New Yorker – it’s not as good as all that but it is good and satisfies the need for a pizza fix – and I miss it ! I agree this is the best Gluten Free Pizza ever and Costco is out of it – ugh. The next best pizza I have found to this one is Three Baker’s – more expensive and smaller but very comparable in flavor and texture. Hoping Costco brings back the Sabatasso’s GF pizza. We love your pizza but Costco no longer carries it, where can we go to get it???????? My husband is gluten free and presently following a FODMAP diet for IBS. Fortunately, I’ve been able to be pretty creative with meals until this week, when I tried to make a gluten free pizza crust. Disaster! Anyway, my husband made a Costco run yesterday and came home with a three pack of Sabatasso’s frozen pizza. I immediately lit the oven for lunch and tossed one in. It was DELICIOUS! I actually went back to the freezer to check the ingredietns on the packaging as I could not believe this was gluten free crust! Loved it! Why buy anything else?